Leopold Center For Sustainable Ag has updated its directory "Learning about Local." A handy reference, available online, it helps Iowans connect with groups supporting local food production and marketing efforts. The popular directory "Learning about Local," compiled by the Leopold Center for Sustainable Agriculture at Iowa State University, has recently been updated to help Iowans stay in touch with the growing number of organizations involved in local foods, including production and marketing. Visit this go-to site for SARE-wide information or seamlessly navigate to regional sites. The publication now includes 85 organizations, programs, funders and consultants that offer various forms of assistance for people interested in local foods systems. That's up from 64 when the Leopold Center first published the directory in August 2009. The longer, more diverse list includes Iowa community colleges that either serve local foods or provide resources for people interested in local foods. One new addition is Luther College's Sustainability Program in Decorah, Iowa, which maintains edible gardens on campus and arranges student visits to local farms. The directory provides current contact information as well as descriptions of each organization's mission, type of assistance offered, program examples and audiences targeted. You can download the publication from the Leopold Center website at http://www.leopold.iastate.edu/resources/guide/guide.pdf. To request a print copy, contact the Leopold Center at (515) 294-3711. Mary Claire Geyer, a Dean's Leadership Scholar in the ISU College of Agriculture and Life Sciences, updated the directory, which was originally prepared by the Leopold Center's former associate director Rich Pirog. In other news pertaining to sustainable agriculture, a news release last week was distributed regarding a new website from SARE which opens the door to information about sustainable agriculture grants and other information. This is the Sustainable Agriculture Research and Education (SARE) program which is funded by the U.S. Department of Agriculture-National Institute of Food and Agriculture (USDA-NIFA). SARE's mission is to advance—to the whole of American agriculture—innovations that improve profitability, stewardship and quality of life by investing in groundbreaking research and education. Grant information, videos, books, online courses, profiles of cutting-edge, on-farm research and much more—it's all available with a click of your mouse at the SARE program's new websites. You can visit any of SARE's redesigned national or regional sites and navigate seamlessly between them to find a wealth of information about where America's farmers, ranchers and ag professionals live and work. A state-of-the-art search function makes it easier than ever to find grant information and dig deep into SARE's library of educational materials, database of research projects and calendar of sustainable ag events in communities across the country. 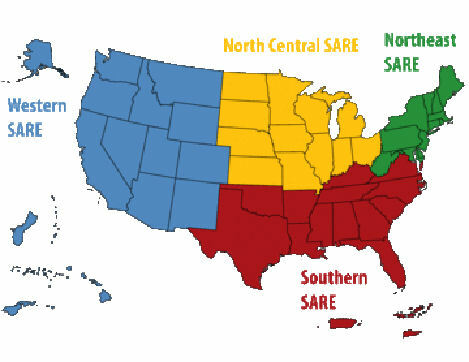 SARE Nationwide: www.sare.org. Visit this go-to site for SARE-wide information or seamlessly navigate to regional sites. Stop at the Learning Center for free downloads of SARE books, bulletins, fact sheets, videos, online courses and a host of other information products searchable by topic or type.